Do you roll your eyes now when Robinson Cano comes to the plate? Do you feel like his at-bats are just demonstrations of slightly different ways to arrive at a weak grounder to second? You shouldn’t — after today, Cano owns the third-highest batting average in the American League, at .318. Not that we pretty much ever talk about batting average, since there are better statistics, but sometimes a simple statistic is more than good enough to tell a story. Cano’s been getting a lot of hits. He’s batting what he batted with the Yankees. But there are different parts of hitting. There’s hitting for contact and average, which Cano is doing. His discipline is basically okay, in that he’s never been a huge walker. What’s been missing is the power component. Cano’s line, at present, is an almost exact mirror of Ichiro’s big-league career, and I’m not the first person to notice this. Cano’s been a hitting machine, but for the most part he’s been a hitting-singles machine, and eyebrows have been raised across the country. 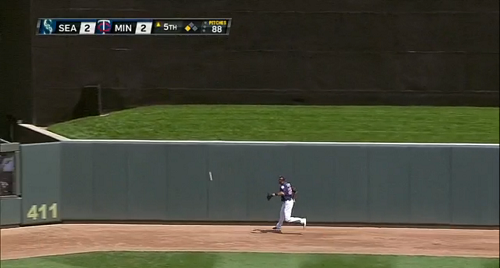 It’s kind of humiliating to be stuck on one homer. Of course, what people will say is that Cano isn’t a classic power hitter. Of course, those people are correct. Of course, that kind of misses the point. Robinson Cano isn’t known as a power hitter. Hisashi Iwakuma isn’t known as a strikeout pitcher. But it would be a problem if Iwakuma were averaging 10% strikeouts. At issue is that Cano is below his own established baseline, that being the baseline of a non-slugger. You expect an ISO around .200. He’s posting an ISO under .100. That’s a legitimate thing to discuss, after a quarter of a season. What I will attempt to do, now, is be reassuring. And this is how this starts: following are three balls in play that Cano has very recently hit. If you’ve been watching, you’ll recognize them. 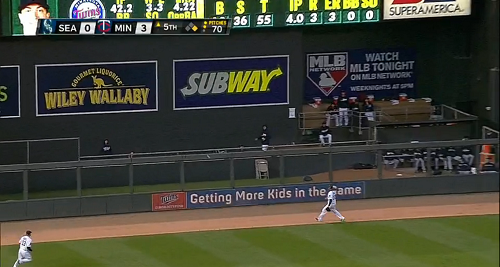 In each case, Cano came extremely close to hitting a dinger. In each case, Cano settled for a double, but there are doubles that are almost singles and there are doubles that are almost homers. This isn’t great analysis, but let’s just pretend those were homers. Then Cano would have four homers and a .441 slugging percentage, with a .123 ISO. He’d have those numbers doing basically nothing differently. The ISO would still be low, but it wouldn’t be as much of a talking point. People notice when a guy has one home run. That “1” is pretty conspicuous, and a “3” or a “4” would be a lot more acceptable. You can’t just give Cano homers, but the point is more that pop is still in there, easy pop, the kind of pop where Cano can hit the ball 350 feet with what looks like a simple flick of the wrists. There’s no reason to believe the power’s gone, right? How would one even explain that? You could say there’s something wrong with his swing. There might’ve been something wrong with his swing, early on. You’ve probably noticed that Cano’s groundball rate is up. But it’s up, and going down. I would say that this is an encouraging split. The first month of the year, Cano was putting way too many balls on the ground. That was not what he was supposed to look like. In May, though, he’s been himself, over 68 balls in play to date. The homers haven’t been there yet, but he’s driven the ball in the air. Today, while Cano hit his first pop-up of the season, he also hit another fly ball and a trio of line drives. While the April sample is still bigger than the May sample, and while the numbers overall are troubling, it would appear that Cano is finding himself. He’s doing the things that’ve made him so good, and he’s come awful close to busting the homer slump. It’s not that Robinson Cano is coming — it’s that it looks like he’s arrived, more or less. It just takes time to recover from a bad start. It takes time to recover statistically, and it takes time to recover in terms of fan perception. We were introduced to Cano as a groundball machine, so it’s going to take time for that to be undone, so we can see Cano as he is and has been. He’s a guy who consistently sprays line drives, and he’s a guy who hits more home runs than he’s hit. Remember: the Mariners have this guy for ten years. Eventually, we’re going to see him in decline, and maybe when he’s declining, he’ll put everything on the dirt. We’ll have time to be frustrated by Robinson Cano. But right now, Cano’s coming out of his slump, and while his April sample is bigger than his May sample, his track record is bigger than his April sample, and his track record is obscene. The hits are already coming. The extra-base hits are presumably going to. I expect we’re going to love this guy before we don’t. I expect you will be proven correct. And thanks for the content. I don’t think I’ve been particularly worried about Cano, but his lack of power did seem to fit right in with the rest of this sad lineup – so I can understand why the various narratives have taken root. They spent too much money for what he can be expected to contribute. The albatross will rise at some point, it’s inevitable. I understand their motivation was to expiate 10 years of bad baseball management (as opposed to financial management) but it will take more than signing Cano. He will probably be better than the average ridiculously large and lengthy contract, such as Fielder. It may be considered a dumb move but there have been worse. An underrated aspect of this contract is Cano’s defense. He is smooth. 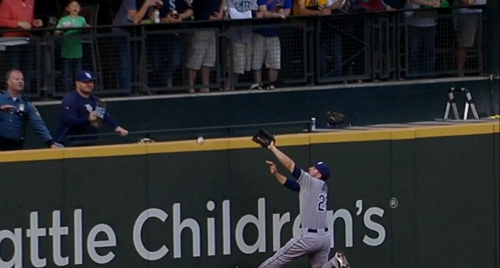 Like Ichiro and Beltre, Cano is a joy to watch play defense. And yes, I know that UZR doesn’t like Cano (but what’s with the 2012 outlier?). What can I say? He “looks good” making the plays. It’s a matter of style. If only everyone on the team could hit like Ichiro. Watching cano play defense is worth the price of admission. The awareness he has of every situation is something that all players could have, but often don’t. He’s only in a hurry when it’s called for and he has a clock in his head based on forethought. At least, that’s the way it comes across to me. The power will come to the degree it usually has, I think. You can’t swing the bat that well and not hit 20 HR’s, even if they’re accidental. It looks to me like pitchers are all hedging low and away against Cano. Until there is a hitter at 4 or 5 that can make a pitcher pay for walking him, he won’t see a decent pitch to hit. It is amazing he’s hitting as well as he is right now. Opposing pitchers are going into games focusing on Cano not beating them. They are executing that game plan. So who were pitchers walking Cano to get to when he was in the Yankees lineup? Because his 2014 walk rate stands at 7.5%, which is lower than the 9.5% rate he had last year with the Yankees. Pitchers may be pitching him low and away, but they aren’t throwing balls (or if they are, Cano is not laying off on them). He may not be getting meaty pitches to hit hard, but would having a dangerous #4 really change that — unless you think that would cause Cano to change his approach and take more walks (while risking more called third strikes on those low-and-outside pitches).